We celebrated our 1 year house anniversary this past December. 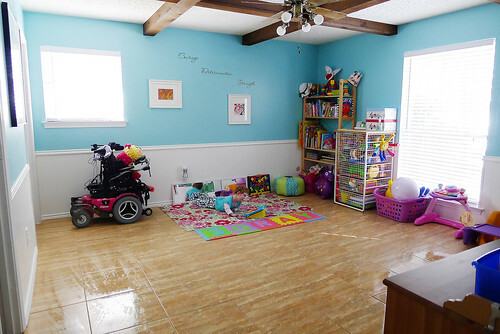 The first home project on our list was to make a designated area for Caleigh to play and to have therapy appointments. The first time we looked at the house I knew that the mother-in-law suite off the kitchen was just the place. Here's the before photos. They were taken in December of '09. Check out teeny tiny Caleigh on the play mat. What a difference a year makes. 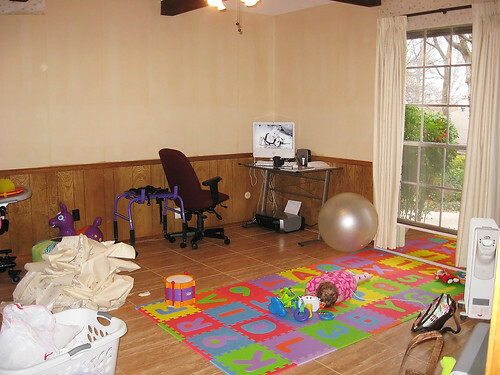 We believe that this was the previous owners' sewing room. We found little sewing needles all over the tile for weeks. 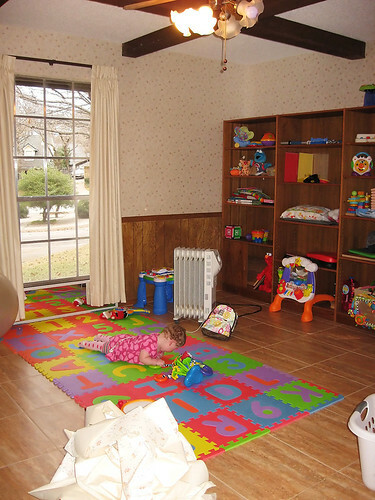 This can be quite the hazard for a playroom, but all is well now, no needles to be seen. The room came with lovely wood paneling and a gigantic shelf unit. We briefly thought about painting the shelf, but after moving it away from the wall we discovered that it was the leaning tower of particle board. It was very unsteady so Eric and I took a hammer to it. It was fun to take out a little energy. 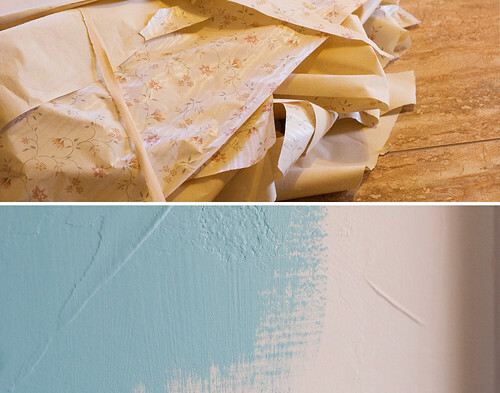 The wallpaper came off fairly easy. I sprayed the walls with hot water and vinegar to remove it. 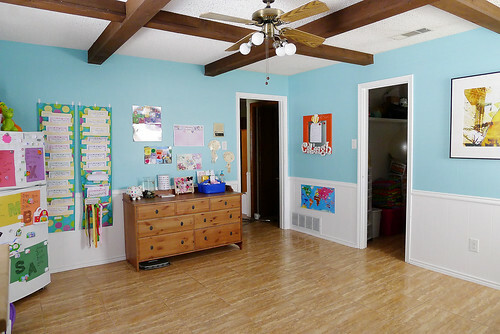 The wall color we chose is called Aqua Chiffon by Olympic. I wanted something similar to a Tiffany Blue and I think it came out pretty close. Eric added a light texture to the walls too. With lots of help from Grampa we painted the wood wainscoting and the entire room pretty quick. The bathroom and walk-in closet got a coat of paint too. Here's the after shots. Cleaner and brighter. Caleigh has her own refrigerator, and has since she came home from the NICU. We keep medicine, truck loads of Pedialyte, ice packs and when needed TPN supplies. 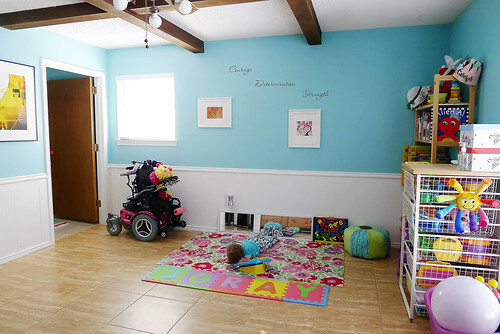 This room gives us the space to keep her supplies together. We got rid of the curtains and put in some faux-wood blinds. The tile was wonderful so we left it. The ceiling fan lacks professional decor appeal, but we haven't gotten around to getting a new one. Perhaps one day. The vinyl words on the wall say "Courage Determination Strength." Caleigh got those as a present for her 1st birthday. I was saving them for this very room. The artwork on the wall is by Melissa Moss. I just love her paintings and they work really well with the aqua walls. 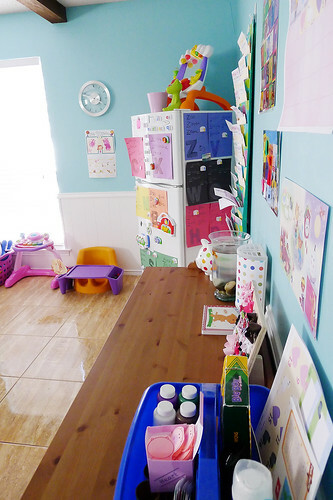 We have a whole area for preschool curriculum and supplies. Eric and I decided to leave the room door and the closet door off for now. This just means there are less obstacles for Caleigh. When Caleigh was on TPN we set up our mixing station inside the closet. This made it really nice to be able and hide everything. All of Caleigh's equipment fits and there is plenty of walking or driving space for practice. Overall the room is Happy & Content. Freshly mopped too. 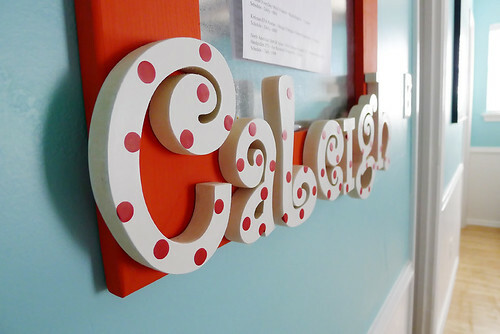 It's the bright spot in our home and we are delighted with how it turned out.